This cola shaped bottle is constructed with a premium 18/8 stainless steel (304 grade) that is engineered to be durable, eliminating the possibility of rusting, denting or shattering. 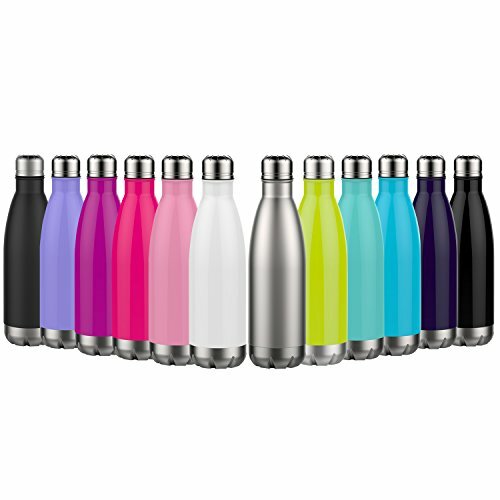 The seamless interior and exterior finish is 100% BPA-free. It does not leech toxic chemicals so you could enjoy your drinks without it altering the taste, making it safer than your average plastic water bottles. Say good bye to table stains and coasters. The double wall structure prevents condensation from forming, making this tumbler sweat-free. The vacuum between the steel walls is surrounded by an additional copper layer that insulates and retains temperature. Now icy cold drinks can last up to 24 hours and pipping hot drinks are kept warm up to 12 hours. Temperature does not transfer to the exterior wall so that you could hold your bottle without the worries of burning your hand or keeping them dry. The powdered coating gives the bottle its color variations, while providing durability against extreme conditions. In oppose to liquid paints, this finish formulates the same vibrant colors without the fear of scratching or chipping. Top dishwasher safe for your cleaning convenience! This bottle won't stain or retain odors, making it easy to clean and reuse. Enjoy your beverage without any lingering taste or smell. Includes a stainless steel lid that is vacuum sealed to provide better insulation. The rubber gasket of the cap makes it leak proof and is easy to screw on and off. The slim design can fit in all cup holders, easily be slipped into any bag and be carried for everyday use. The narrow opening is easy to fill and fits normal ice cubes. Sip your drink without spilling or sloshing.